Home / All News / Are mega-bills now a mega-bust? Are mega-bills now a mega-bust? After time ran out on the 2018 legislative session, two of the Capitol’s top leaders expressed interest in avoiding a future full of thousand-page mega-bills. House Minority Leader Melissa Hortman, DFL-Brooklyn Park, was asked late on May 20 if DFLers would act differently should they win back the majority this year. She sounded resolute: No more bills like “Omnibus Prime”—also known as Senate File 3656—would pass if she is house speaker, she said. She also predicted, accurately, that Gov. Mark Dayton would veto that bill. When he did on May 23, he nixed a lion’s share of legislation for the entire session. “I’ll believe it when I see it,” said Sen. Richard Cohen, DFL-St. Paul, the Senate’s senior member. Cohen is a 10-term DFLer whose legislative career began with his election to the Minnesota House in 1976. He has himself shepherded mega-bills through to signage during supplemental budget years. His skepticism that change is afoot could be well placed. 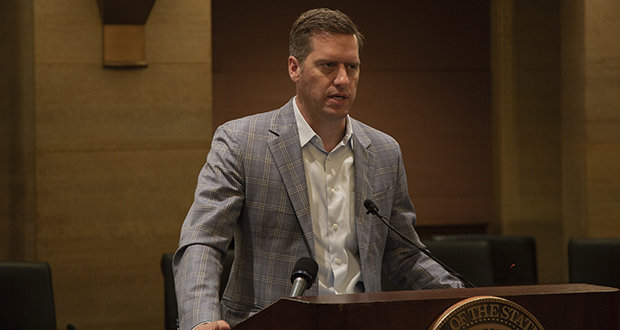 House Speaker Kurt Daudt, R-Crown, was asked several times on May 23 whether he plans to pare back future spending bills. Each time, he ducked the question. When Dayton vetoed SF 3656, he killed a supplemental finance bill that included a modest $134 million one-year allocation for fiscal year 2019, but a ton of policy—most of it produced by the House. Dayton vetoed it despite a marathon late-session exercise in which conference committee members amended or stripped away 71 of the 117 provisions he identified as objectionable. It wasn’t enough, the governor said after vetoing the bill. Yet jamming policy provisions into massive supplemental finance bills in even-numbered years is neither a new nor a one-party phenomenon. It happened in 2016 when Cohen—then the Senate DFL’s Finance Committee chair—worked with House Ways and Means Chair Jim Knoblach, R-St. Cloud, to combine three omnibus bills into a single, 599-page, $182 million supplemental budget-and-policy bill. Dayton signed that one. The picture does not change with one-party control. A DFL House and Senate majority in 2013 passed an omnibus supplemental finance bill that included 577 pages of budget and policy. And that doesn’t count that same year’s health and human services omnibus bill; its 703 pages travelled alone. Dayton signed both. The DFL majority’s 2008 supplemental budget bill, meanwhile, was 288 pages. This year’s solo-flight 986-page supplemental budget—or “monstrosity,” as Hortman termed it—was an attention grabber. Sen. John Marty, DFL-Roseville, worries that it signals a sudden swelling of a supplemental budgets that could portend a future where legislative sessions produces a single, take-it-or-leave-it bill for a governor to either sign or decline. The question becomes what, if anything, can be done to turn the corner on an apparently inexorable trend. Sources differ. Today’s legislative world is not the same as the one Cohen entered in 1976; it is much more complex. Where once there were only a few, there now are some 11 budgeting divisions—each of which produces its own finance packages. Supplemental budgeting years, meanwhile, are short. As has often been stated, mega-bills arguably violate the Minnesota Constitution’s single-subject clause, which dictates that every law passed must address a single subject that its subject be reflected in the title. The Legislature’s response has been to bundle mass bills under the rubric of “government operations” and give them sprawling titles spanning multiple pages. Dayton has called on the courts to put a stop to that practice. Marty has been contemplating filing suit for about a year to force the issue. Other lawmakers, including Rep. Mike Freiberg, DFL-Golden Valley, and Rep. Steve Draskowski, R-Mazeppa, pitched a late-session constitutional amendment that would have better define the single-subject rule and give courts guidance in better interpreting it. They likely will pursue something similar next year, they say. But courts in Minnesota, as elsewhere, have struggled to enforce single-subject rules. Forty-one of the 50 state constitutions contain such rules, according to a 2014 study in the Valparaiso University Law Review. But all have been effectively “rendered dormant” because courts consistently refuse to enforce them, write the study’s authors, Justin W. Evans and Mark C. Bannister. Even when the state Supreme Court tackled the provision, as it did in Associated Builders and Contracting vs. Ventura (2000), it merely stripped out an offending provision rather than kill the underlying bill as unconstitutional. In his dissent to that ruling, former Justice Paul Anderson complained the court had granted itself a line-item veto while inadvertently boosting legislators’ confidence that they could cobble together monster bills with no worse fear than losing one offending provision. Davids flatly declares the single-subject rule a dead letter. John Augustine of the nonpartisan Legislative Evaluation Assembly of Minnesota is among the chorus of observers who worry that bill-stuffing may be on the verge of intractability. “It is very institutionalized,” he said. He sees Freiberg’s constitutional amendment bill as a positive sign—at least some lawmakers want to reverse the trend. But even if that passed, it would be no panacea, he said. The constitution’s current language is hardly vague, Augustine said, yet courts don’t enforce it. For Augustine—as for Cohen, who expresses a similar view—the answer is in the ballot box. A change in leadership, to one that recognizes how destructive take-or-leave-it bills can be, is the remedy needed, he said. Steven Schier, a Carleton College political science professor, does not disagree that voters could change things, but he wonders how likely that is. He traces the mega-bill trend to two factors—extreme partisanship and what might be called extreme unity. In the current polarized environment, Schier said, when government is divided, bills get jammed with provisions that dare governors of the opposite party to either accept or veto them in toto. Under one-party rule, the script gets flipped but the result is the same, Schier said: Mega-bills then become one-stop shops for fulfilling ideological wish lists. Given that voters are notoriously uninterested in political process, the professor said, he is skeptical that change is in the offing.